Above: Assembled Saturday morning, the bus shelter on Highland Avenue was seeing plenty of use by noon. Pushpins are thumbtacks-on-steroids, used literally to attach papers to bulletin boards or virtually to mark positions on online maps. In East Baltimore, three artists have created a pushpin-on-steroids to put a neglected community on the map and welcome new residents to the area. 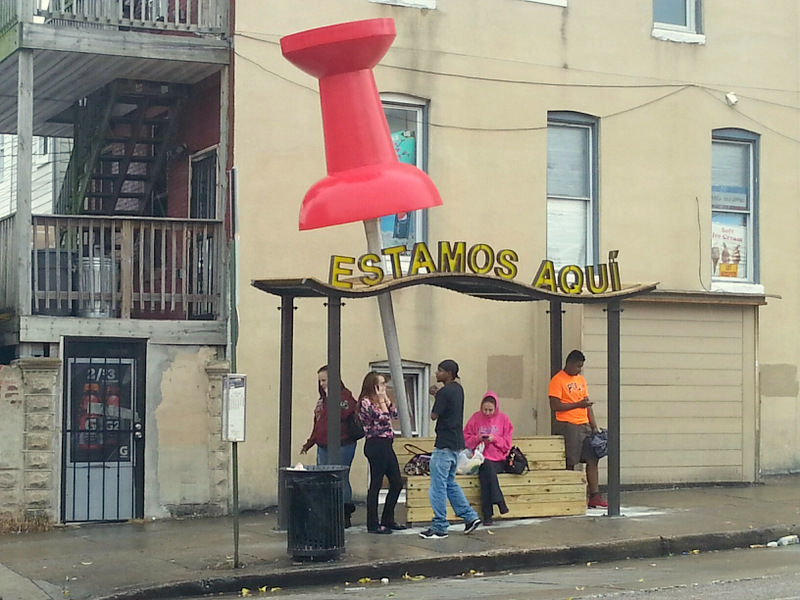 The big red pushpin is the main feature of a custom bus stop that was erected in four hours this weekend near the intersection of Baltimore Street and Highland Avenue, in the neighborhood known as Baltimore Highlands. The oversized pin juts into the sidewalk at an angle, as if it’s pinning the shelter to the ground. On the shelter’s undulating roof is the Spanish phrase, “ESTAMOS AQUI,” a nod to the many Latino residents who have moved into the area. 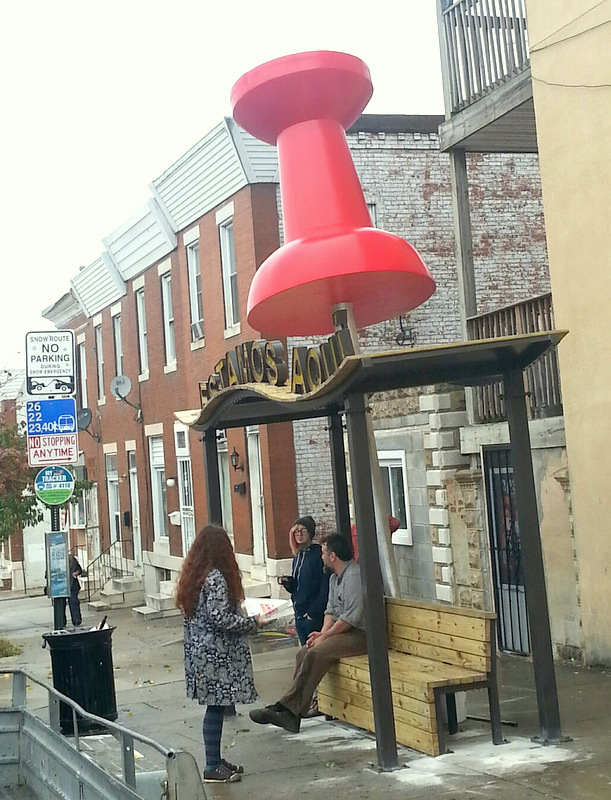 “We decided to do the pushpin as a statement about putting our neighborhood on the map,” said artist Rachel Timmins, who designed the bus stop. The pushpin was a reference to the icons used on Google Maps, she said, and the phrase was meant to embrace the neighborhood’s diversity. “Estamos aqui means ‘we are here’ in Spanish. . . We have the most diverse population in Baltimore City but we have a very large Latino population, so we really wanted to highlight that. We want to be inclusive,” said Timmins, co-president of the Baltimore Highlands Neighborhood Association. The project is a collaboration of the Southeast Community Development Corporation, local residents and artists of the Highlandtown Arts District and the association. Timmins’ design for the bus stop won a $25,000 PNC Transformative Art Prize for 2015. She collaborated with two other artist-engineers, Kyle Miller and Tim Scofield, to fabricate the shelter, mostly off-site. They arrived to install it in the rain yesterday at 6:45 a.m. They were done by 11. Timmins, who also works as a community aide to 2nd District Councilman Brandon Scott, said her rowhouse neighborhood doesn’t get the same attention from the city as many other communities and doesn’t have many landmarks besides a nearby cemetery. She said she saw the bus stop as a way to create a new sort of landmark that sends a message about the community and the fact that it’s changing and needs more attention. The giant pushpin is clearly inspired by the work of Claes Oldenburg and the late Coosie van Bruggen, sculptors best known for public art installations featuring large replicas of everyday objects, from a pair of binoculars in southern California to a spoon in Minneapolis that becomes a bridge. Timmins said she used bright red for the pushpin because it’s a powerful, vibrant color. The “pin” is actually a re-purposed light pole turned upside down, and the red top is made of a synthetic stucco material. The shelter itself is a utilitarian structure with metal posts, a wooden bench and an open space for someone in a wheelchair. Its roof undulates like a fluttering piece of paper that needs to be held down by a pushpin. Pinning down something that might otherwise scatter to the wind could also be a metaphor for the community itself. Timmins’ work has been shown in numerous exhibitions, both nationally and internationally, and in many publications, including Unexpected Pleasures published by Rizzoli Publications, Contemporary Jewelry in Perspective published by Lark Books, and Jewel Book: International Annual of Contemporary Jewel Art published by Stitchting Kunst Boek. 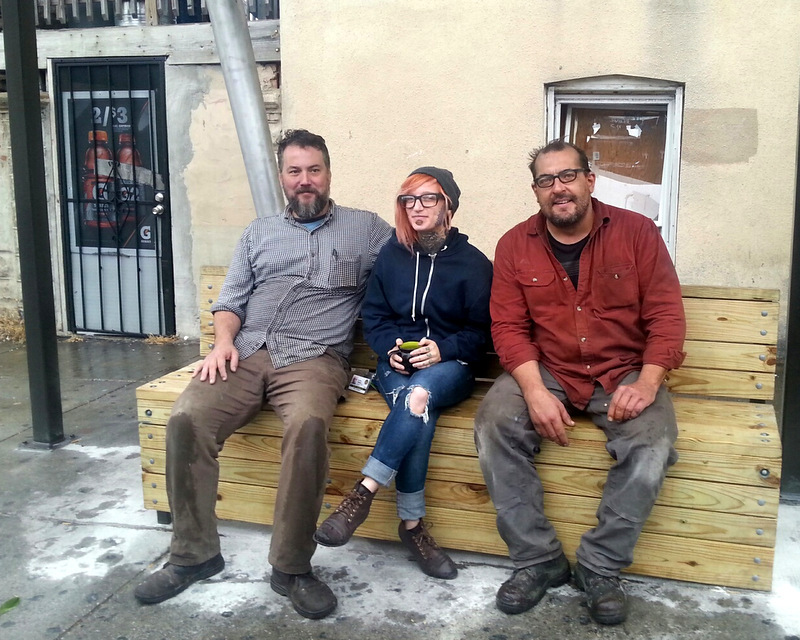 Miller and Scofield are Baltimore sculptors who collaborated last year with the Madrid design collective Mmmm… to create the Highlandtown “BUS” sculpture, a bus stop and pedestrian shelter in front of the Creative Alliance that consists simply of three letters: B U S.
The two artists are currently working on four 8-foot-tall fabricated steel sculptures for Patterson Park. The PNC Transformative Art Prize is a program of the Baltimore Office of Promotion & The Arts (BOPA), made possible through a partnership with PNC Bank and Baltimore’s housing department. Besides the $25,000 PNC prize, funding for “Estamos Aqui” included $5,000 from the Baltimore Community Foundation and $5,000 from Healthy Neighborhoods Inc.
Baltimore Highlands is a far Eastside district that stretches from East Pratt Street to Pulaski Highway and from Highland Avenue to Haven Street. It overlaps somewhat with the Highlandtown Arts District but is primarily residential. The bus stop was selected as the setting for the art work, Timmins said, because it’s busy around the clock, serving MTA routes 22, 23, 26 and 40. To mark completion of the bus stop, Southeast Community Development Corp. and BOPA will be holding a community celebration next Saturday (November 14) from 2-5 p.m. at 3400 East Baltimore Street. The celebration will be a free neighborhood block party featuring a mobile photo booth, Mexican specialties from Monte Alban’s food truck, and family-friendly activities from the Waterfront Partnership, Maryland Institute College of Art, Fantastic Faces, Blue Water Baltimore and the Family League. In keeping with the bus stop’s Latin theme, a musical group called “Zakke” will offer live entertainment with high-energy Latin rhythms and modern rock and ska beats. “Anexo Social” will follow with Latin Cumbia sounds fused with Reggae and ska rhythms. The bus stop, meanwhile, is already getting heavy use. As soon as the artists drove off Saturday morning, people started gathering under the pushpin shelter to wait for their buses. “I love it,” said Laura Irvizu, who lives on Lakewood Avenue.